Haute-Garonne (French pronunciation: ​[ot ɡaʁɔn]; Occitan: Nauta Garona; English: Upper Garonne) is a department in the southwest of France named after the Garonne river. Its main city and capital is Toulouse. Haute-Garonne is one of the original 83 departments created during the French Revolution on 4 March 1790. It was created from part of the former province of Languedoc. The department was originally larger. The reduction in its area resulted from an imperial decree dated 21 November 1808 and which established the neighbouring department of Tarn-et-Garonne, to the north. The new department, created in response to the pleadings of various locally powerful politicians, took territory from five surrounding departments including Haute-Garonne. The districts lost to Tarn-et-Garonne in 1808 were those of Montech and Castelsarrasin. 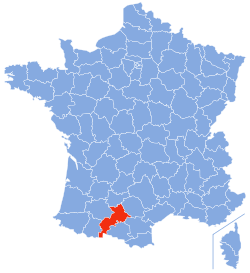 Haute-Garonne is part of the current region of Occitanie and is surrounded by the departments of Hautes-Pyrénées, Gers, Tarn-et-Garonne, Tarn, Aude, and Ariège. It also borders Spain in the south (province of Lleida and province of Huesca). The department is crossed by the upper course of the Garonne River (hence the name) for nearly 200 kilometers (120 mi). The borders of the department follow the river. The Garonne enters France from Spain at the town of Fos, and goes through Toulouse and leaves the department. The extreme south of the department lies in the Pyrenees mountain range and is very mountainous. The highest elevation is the Peak of Perdiguère, at 3,222 meters (10,571 feet) above sea level. This department was the political base of former Prime Minister Lionel Jospin. The President of the General Council is Pierre Izard of the Socialist Party. The inhabitants of the department are called Haut-Garonnais. The greatest population concentration is around Toulouse. The south of the department is quite sparsely populated. More than a million people inhabited the department at the last census in 1999. Young people are well represented with 55% of the population under the age of 40 and of those, 16% are between the ages of 20 and 29. This is because Toulouse is a university town. The department has four ski resorts.